But I know a change gon' come, oh yes it will." I’ve been reading crime fiction for over 30 years. Hell, I still had a good head of jet black hair when I first read Chester Himes’ A Rage in Harlem. I think that I’d have been around 18 years old when I picked up a battered copy of the Panther edition of the paperback whilst I was rummaging through the bargain bin of a second hand bookshop in Leicester’s Silver Arcade. I was first drawn to the unusual and garish ‘blaxploitation’ cover (a black nun with a smoking cigarette in one hand and colt revolver in the other!) but the real joy was to be found inside the book; I read the first three lines from chapter one of Harlem, was hooked and I’ve been hooked on that hardboiled kind of noir crime fiction ever since. 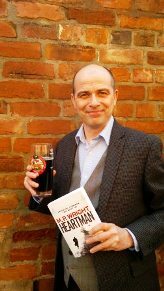 I’ve been asked on a number of occasions about where the idea of my book Heartman came from? I think the simplest explanation is that I wrote the kind of book that I wanted to read myself. It is often said that a writer’s first work of fiction is in some way semi – autobiographical; and whilst some who write may disagree with that statement, (hopefully they’ll be a few scribes who agree with me) there is much in Heartman’s origins that can be traced back to my own ‘life’ experiences. I’d spent more years than I cared to remember working with ‘real life’ criminals, often shift work in bail hostels and the like and during that time I wrote (everything from one act stage plays to poetry). Some of the more ‘unusual’ working incidents and encounters that I’ve experienced have found their way onto the written page but much has simply derived from my own imagination. Crime writers such as Walter Mosley, Ross MacDonald, Raymond Chandler, Dashiell Hammett and James M Cain have made a great impact on my own writing style. Heartman is written in the first voice. My Bajan detective Joseph Tremaine Ellington in effect takes you by the hand and leads you through the story which is set in 1960’s Bristol. I’m expecting the reader to believe and trust in Ellington’s character and motivations. For a debuting crime writer, first voice narration can be a long shot and can be a style that is not to easy to pull off. But from the beginning, I was confident of my own writing voice and more importantly in Ellington’s voice. I believe you trust in the character of J T because of a number of simple factors which, as a writer I’d put in place early on. Firstly, I believe Ellington exudes a strong sense of integrity; he’s a man who elicits trust from both his actions and the strong moral compass that he possesses. (That moral compass is counter-balanced by those around him he cares for – such as Vic Ellington, J T’s rough around the edges cousin.) Joseph Tremaine Ellington is an ex colonial police Sargeant, he has a background in policing on the island of Barbados. He is in many ways a ‘reluctant detective’ – reluctant in the sense that when we first meet him his back is against the wall, he’s desperate. J T takes on a missing person job through necessity; he’s broke, jobless and about to find himself out of his digs and on the streets in the dead of winter. Secondly, I tried to give Ellington less obvious stereotypical ‘Noir Detective’ traits. When we first meet J T he is not working as a private detective, far from it in fact. He’s been recently working in a cigarette factory and ‘sacked’ after an altercation with a bullying foreman who falsely accuses him of theft. I wanted to allow the reader the opportunity to gather some real empathy for the character by witnessing both the hardships he undergoes daily and the ordinary life he leads. Despite being thousands of miles from home, J T has close family living near at hand (his Aunt Pearl & Uncle Gabe and of course, Cousin Vic) and there is a strong thread that filters through the book about the importance of family and having those we love near to us. Ellington is a broken man and a man with secrets; life has not been kind to him in the 12 months that precede Heartman’s story. He is though, far from being a victim or downtrodden. He’s getting on with his life the best he can, trying to make his way in a new world, a world unlike the one he has grown up in. He’s no hero, that’s for sure, and nor does he want to be. I see him as a decent man who is thrown into a murky word of indecency and corruption which is played out by men of power. Ellington’s journey through the darkness and depravity of the criminal underbelly of a British city he barely knows is a very personal one and although not a hero in the traditional sense, the manner in which he behaves when faced with adversity and danger throughout the book is, I feel, truly heroic. I wanted to write about the kind of character we hadn’t seen a great deal of in the UK crime fiction arena. I wanted to bring the feel of James Lee Burke, Raymond Chandler and Walter Mosley’s style of detective writing to the streets of Britain and set it at a time when those immigrating from the Caribbean and West Indies were experiencing first hand, what my dear Bajan friend, the poet and playwright Victor Richards calls the harsh realities of the ‘streets paved with gold.’ I didn’t want to shy away from the stark realities of the times, theracism, sexism and social intolerance and at the same time not fall into the unwelcome pit of clichés that could have easily been the case. Ellington and Bristol of 1965 had to be firmly grounded in reality – I hope I’ve been successful in achieving that. Currently, the crime fiction market is extremely competitive and that said, I knewI had to bring something new to the table whilst still ‘doffing my cap’ to a much loved genre’s respected heritage. I wanted readers to feel comfortable and at home with the 60’s setting, my characters and their motivations and attitudes. It was important to reflect the mores of the times, good and bad, seeing the 1960’s as the decade it really was, the advancements socially and also the downsides. I wanted to tell a story that harked back to a bygone era and yet one that still resonated with a modern 21st century audience. Optioning the book to television producers; World Productions, (Makers of BBC’s Line of Duty and ITV’s, The Bletchley Circle) last year gave me some idea that I was on the right track in how I’d pitched the tone of the book. Producer Simon Heath got the ‘feel’ of book from the off and really had an understanding for the atmosphere and slightly retro vibe that I had created in Heartman. Ultimately I hope the readers feel the same and would like to read of J T’s escapades in the future. I’m currently working through the final edits of book two; provisionally titled, ‘All Through The Night’ – it’s a step up from Heartman in pace but maintains the feel, mood and tone of the first book. At its heart it’s a chase story and I’ve again put Ellington in a place he’d rather not be. I unfurl more of the man’s secrets and background, and I’m pleased to say that more of his rather belligerent and blackly humorous temperament shines through too. (A couple of personality traits I share with the man as well as my birthday.) It’s set at a time of great social change here in the UK and around the world. It highlights both the cruel hostilities inflicted on minorities by others and the racial intolerance that was so prevalent at the time and which is something we must be constantly mindful of now in 2014. The lyrics to Sam Cooke’s ‘A Change Is Gonna Come’ echoes many of the themes explored in the next book and to some degree, the sentiment from that beautiful and thoughtful song run deliberately through Heartman’s prose. It’s a message I hope readers warm to in the same way I hope they warm to the characters that I have created.